It’s finally spring!!! I know that I’ve been complaining a bit about wishing spring would just get here. Well it has, and I’m celebrating. The rains have stopped, the sun is out, the flowers are in bloom (check out the photo below! ), my raised garden beds are built. How can I not celebrate? Last night I made the most amazing salad. 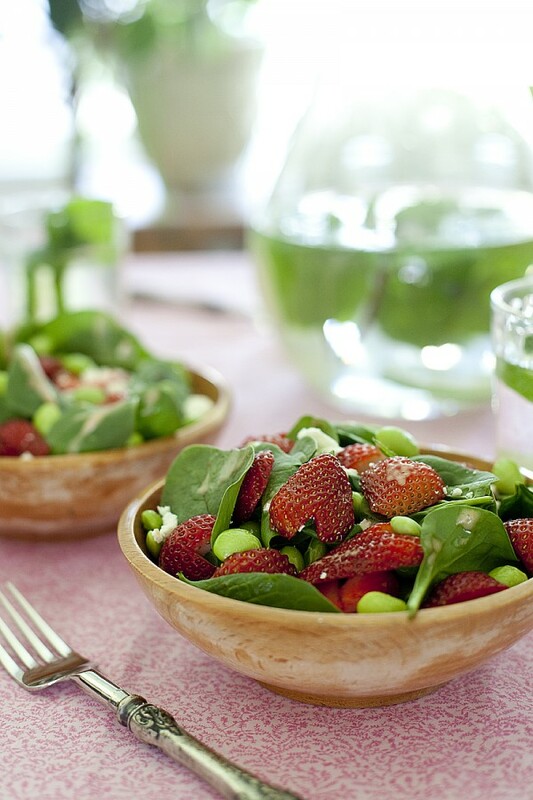 Strawberry spinach salad recipes are always popular and always delicious. 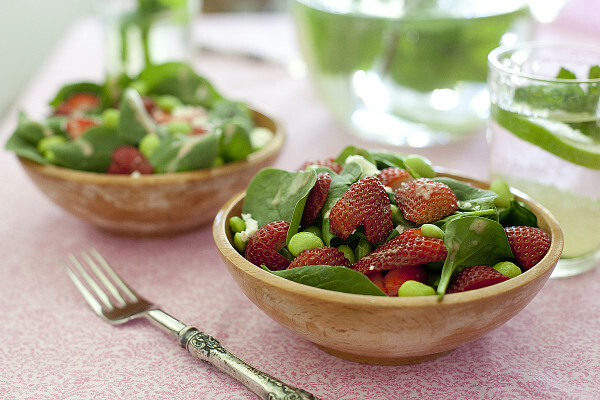 But I found a way to take the classic combination of spinach and strawberries to new heights. Edamame. That’s Ed-Uh-Ma-May (aka soy beans). I know that I make a lot of spinach salads, and I probably say that every one is the best spinach salad recipe, but for right now, this one is blowing them all out of the water in my book. Speaking of best…last week Eric and I had the best day with his cousin Elise and her husband Eric (yes, there was some confusion with two Erics in the house). We made perogies for dinner, post coming soon, and had a fantastic time. 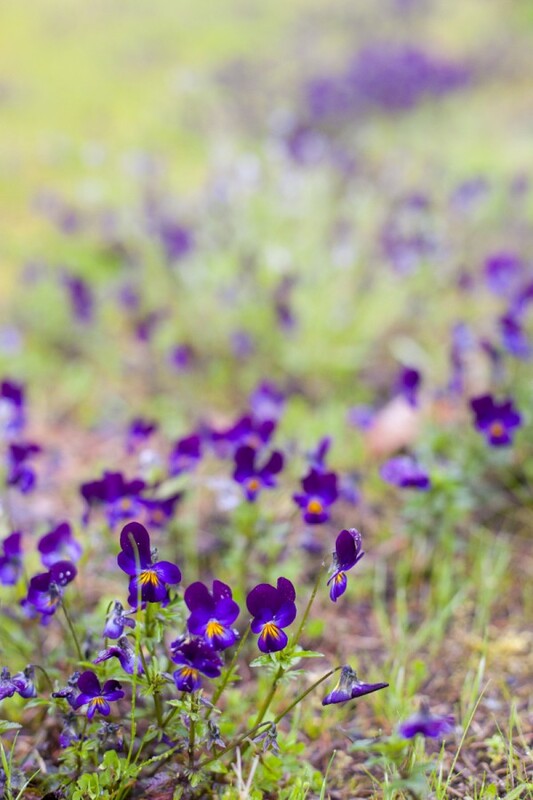 But one of the best treats of the day was when Elise took me down the street to see the field of wild violets. Now doesn’t that look like spring? That field gave me hope that the rains would end, and the freshness of this salad has me convinced that the sun is truly here. It’s bright, cheerful and full of flavor. It’s especially amazing if you have access to the tiny strawberries of spring, though we haven’t had enough sun for any here. 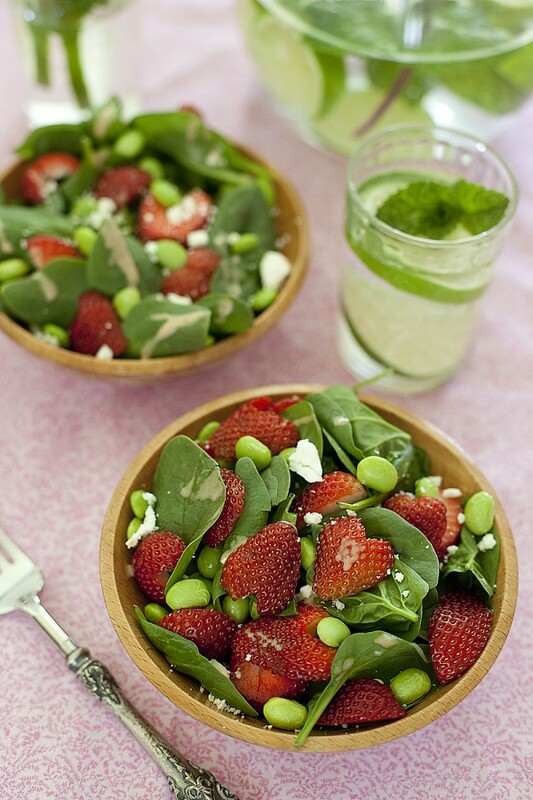 While edamame takes this salad from basic to fantastic, when it comes to a good spinach and strawberry salad, dressing is key. I really like creamy dressings on spinach salads, but I wanted to try and keep this dressing lower in fat and vegan. That’s where my good friend the blender comes in. By whirling my vinaigrette in the blender, I get a rich and creamy dressing without having to add mayonnaise, cream or buttermilk. Don’t get me wrong, we don’t necessarily keep the salad vegan. You’ll notice there’s a little feta in the recipe, cause it’s “bettah with feta!”, and we even topped ours with sliced lamb. Yeah, far from vegan. But when I can, I try to make it easy to adapt my recipes to be vegan and gluten free. With this one, it’s easy! I have a feeling we’ll be eating this salad at least once a week over the next few months as I wait for my lettuce to sprout. Do you have a favorite spring salad? Cook edamame according to package directions. Let cool. Hull strawberries and thinly slice. Divide spinach between four plates. 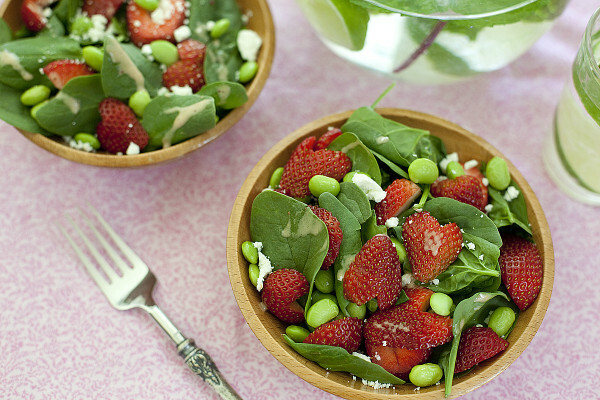 Top with edamame, sliced strawberries and feta. Place olive oil, vinegar, mustard, strawberry preserves and salt in a blender. Blend on high until creamy. Drizzle dressing liberally over salad. Approximate cost/serving: I got my strawberries on sale for $3 for about 40 berries. The baby spinach is really cheap at any of our bulk stores like Sam’s Club, Costco or Cash and Carry. Edamame is cheapest at an Asian grocery store. This came out to about $4 so $1 a serving. Ours cost a little bit more because I added some leftover roasted lamb to make it a full dinner. Vegetarian/gluten free: The recipe is already gluten free and vegetarian (just dairy). You can make it vegan by skipping the feta.